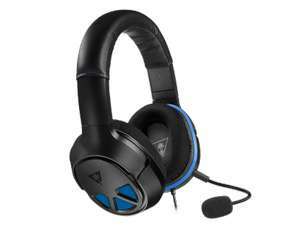 The TURTLE BEACH® RECON 150 gaming headset for PlayStation®4 delivers the unbeatable sound and quick access controls needed for multiplayer victory. The RECON 150 provides amazing game and chat audio through large, high-quality 50mm over-ear speakers while Turtle Beach’s renowned high-sensitivity mic picks-up your voice loud and clear. The RECON 150’s fabric-wrapped ear-cushions and synthetic leather-wrapped headband offer better breathability and added comfort for those hours-long gaming sessions, and the adjustable mic can be removed when watching movies and listening to music. Convenient in-line controls place Master Volume and Mic Mute right at your fingertips, and the standard 3.5mm connection makes the RECON 150 great for using with other compatible devices. It's £29.00 on Amazon, so the postage getting it direct from Turtle Beach is a factor to look at if you're an Amazon Prime customer. "Versatile Compatibility - Works great with PlayStation®4 and Xbox One controllers with the 3.5mm jack, as well as with PC, Mac® and mobile/tablet devices with a 3.5mm connection. Older Xbox One controllers require the Headset Audio Adapter."